The first Marepe work I encountered years ago was a simple video of a soccer team going through their collective warmups before a game. I’ve long since forgotten the title of the work, but I can clearly recall the mundane-yet-graceful movements the players made in one mass, shaking the legs in a particular way, or gently swinging arms as they carried out particular footwork sequences, all in a low-fi video haze shot at a distance. The effortless motions of the players seemed echoed in Marepe’s light-handed appropriation—which was necessarily blunt, like a magic trick showing how easy it is to transform a common experience into a surreal one. His new work at Galeria Luisa Strina is mostly comprised of sculptural works displaying a similar transformative bluntness, in this case wielding functional objects instead of soccer players. Bodies are everywhere still, often as personified characters where the artist has coyly altered a kayak or sugar-cane press to reframe them as whimsical cartoons. 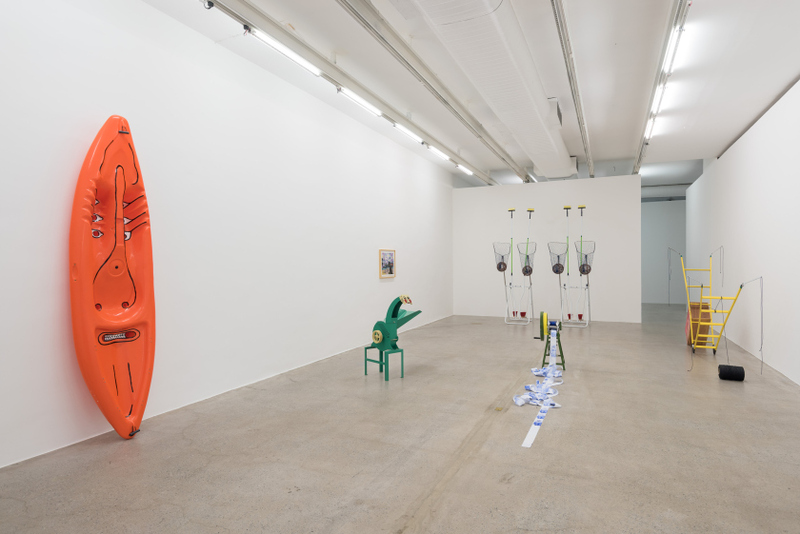 But even in works where his playful humor isn’t explicitly employed, nearly every component is an industrial-designed instrument of human use: ladders, nets, brooms, desks, helmets, jumper cables, plastic stools. The body is made present in its absence, the missing piece of the equation for whom the objects were designed. It is easy to imagine stepping inside particular pieces since their seats, handles and contours still seem ready to interlace with a body, fusing into some folk-cybernetic assemblage. Marepe has long been inspired by the ingenuity of Bahian street vendors, whose customized carts are a master class in vernacular design, with their optimization of form and materials. In this new work, he continues to pay homage to this tradition with readymade objects that allow their materials to be purposeless instead of functional. Perhaps the best illustration of this is a stack of cheap plastic stools, reaching eight feet into the air, with variegated bright colors punctuated by the offhanded arrangement. Yet, pieces that stray further away from functional origins into more “purely sculptural” territory tend to lose their punch: a separate room is dedicated to explorations of materials such as wire and spray foam, with a rustic formalism reminiscent of Arte Povera, but these more hermetic material-meditations seem lifeless after passing through the quotidian richness of the other works. 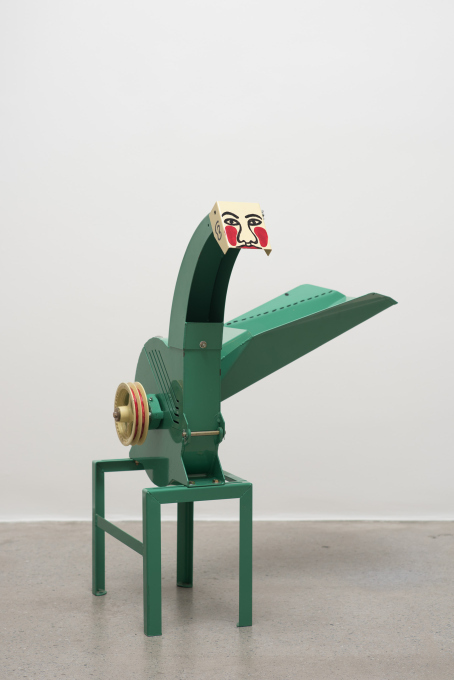 Conversely, Marepe’s playfulness and humor can also seem heavy-handed, as in a sugar-cane-press-turned-printing-press, perhaps winking at the viewer a little too hard with its paper roll of repeated caricatures splayed across the floor. But when he employs a light touch, his appropriations once again resemble the effortless fluidity of those soccer players lost in their own movements.